The public forum Justice for Hicks & Habib was quite a success. Approximately 130 people attended the event, a big number for a Saturday eve! Speakers for the evening were: Terry Hicks, Jeremy Styles (representing Cameron Murphy) Secretary of the NSW Council for Civil Liberties; Dr Tim Anderson, Academic and civil rights campaigner; Stephen Hopper, Mamdouh Habib's solicitor; and Maha Habib, Mamdouh's wife. Peter Breen, Ian Cohen, and Dr Arthur Chesterfield-Evans. Lee Rhiannon also attended the forum, unfortunately she left early due to other commitments.Other contributors for the evening were Raul Bassi and Richard Phillip. Actively Radical TV filmed the event, and hopefully a video will be made available to the CBPeace group, hence those unable to attend can access the information given on the evening, and those present can once more listen to the inspiring guest speakers. There are a number of people who ought to be thanked - without their invaluable contribution the organising process would have been much more difficult. Thanks to the Forum Steering Committee; friends who lent a hand on the evening; and Actively Radical TV for filming the event and realising Mr & Mrs Habib's Sydney visit. Special thanks go to our guest speakers and Brett Collins from Justice Action who unconditionally provided his time and access to Breakout to carry out Terry Hicks Press Conference. Thanks to Brett the PC was a successful event with 23 journalists attending. Thanks to Dominic Fitzsimmons, Tim O'Connell, Paul Sheridan and Brett for helping draft Media Releases. Furthermore, thanks to Brett and Lee Rhiannon's office for sending out the Media Releases. A big thank you must go to Daryl Melham, Federal Member for Banks, who has supported us throughout with printing and advice. Thanks to everyone who supported and provided their invaluable time to promote Justice for Hicks and Habib. It must be said, that many people have added their support to the campaign Justice for Hicks & Habib. At present, we are in the process of contacting them with the aim of organising information forums and galvanising community support, thus we can have the impact required to achieve our main objective - release or repatriate David and Mamdouh. Finally, we urge everyone to write to the recent appointed Attorney General, Philip Ruddock, the PM, John Howard, and leaders of the various political parties, requesting the Hicks & Habib's matter be raised with George W Bush when he addresses Parliament next 23 October. Terry Hicks, David Hicks father, one of two Australian [scapegoats] held imprisoned [and tortured] at Guantanamo Bay, arrives tomorrow Saturday 20 September in Sydney. He will hold a Press Conference at 2pm at Breakout, 65 Bellevue St. Glebe. Civil Liabilities: Howard's diversity? I had a dream? Keep the bastards honest: Publicity keeps an eye on ethics? The Australian Federal Police commissioner says investigations into terrorist links [scapegoat and patsy links] to Australia are being made more difficult by public debate about the progress of inquiries. Howard, Ellison, Williams, Australian terrorists, Muslim bashing! Brothers sacrificed! [War criminal], Attorney-General Daryl Williams said the Australian Federal Police and ASIO, [Australian state-terrorists], had been in contact with Lebanese authorities over the Khazal brothers. "The Australian authorities are well aware of the fact that a warrant was issued for the arrest of Mr Khazal and his brother in June," [war criminal], Williams said yesterday. War criminal, Attorney-General Daryl Williams who? Daryl Williams who? Oh you mean that Daryl Williams, would you believe him? You say he what? Confirmed last night the Government was aware of claims that Sydney man Bilal Khazal and Melbourne cleric Sheikh Mohammed Omran were linked to an al-Qa'ida detainee known as Abu Dahdah. The Islamic Youth Movement has denied having any links to Al Qaeda and says it is considering legal action against the Four Corners [Walls] program. In a statement released early this morning, the group rejects allegations it is helping coordinate any kind of terrorist network inside Australia and says it is being unfairly targeted. Four Corners [Walls] has [allegedly] cited a CIA document alleging Bilal Khazal was not only an Al Qaeda operative but was planning attacks on US interests in Venezuela and the Philippines, but Mr Khazal has denied the claims. Parody: New airport security concerns have been raised by reports that a woman believed by JI to be associated with Four Corners worked as a baggage handler at Sydney's international terminal. Parody: More evidence has emerged that the ABC terrorist network believed to have been behind the propaganda in Australia has tried to set up a long-term base in Bali. The Australian terrorist Captain Cook infiltrated Australia years before the Bali bombings in which 202 people perished. Aboriginal people attempted to remember Captain Cook not as a founding father but as a harbinger of dispossession and death, a sign of white amnesia. Another anniversary year-used to mark two hundred years since Cook had journeyed along the east coast of Australia and, for some people, discovered a continent. NSW police confirm don't use the phone to talk about terrorism! Suspected terrorists [scapegoats and patsies for the Coalition of the Killing's resource wars in the Middle East] will be tried in secret under new laws to be introduced by the Federal Government. Civil libertarians are questioning the need for further anti-terrorism laws, which will be announced in the New South Wales Parliament on Tuesday. Evidence that Howard was complicit in CIA, false flag, call to arms, Bali bombings War criminal John Howard was complicit in the call to arms - false flag operation - Bali bombings - instigated by the CIA - and the Coalition of the Killing - to bolster support - and quell dissent for their illegal and degrading resource wars in the Middle East. The Human Rights Council of Australia (HRCA) says it fears Prime Minister John Howard's comments in support of the execution of [CIA operative] Osama bin Laden show his eagerness to overturn three decades of national opposition to the death penalty. State terror units caused the terror! The level of suspicion and surveillance created by the [US false flag operation and call to arms] Bali bombings, created by [ the Coalition of the Killing and Australian's complicity to go to war on Iraq] means that all Australian's suffer the loss of their human rights, civil rights and their democratic rights, as well as those Australian's who lost their life in Bali. Al-Qa'ida or poor people without hope? Anyone contemplating war without a UN sanction is nothing more than a common criminal and not acting in accordance with the law. Isn't Richardson the head of ASIO? A law enforcement agency? Al-Qa'ida is a Coalition of the Killing demon made up by the CIA. These people are just scapegoats, patsies, and peasants." 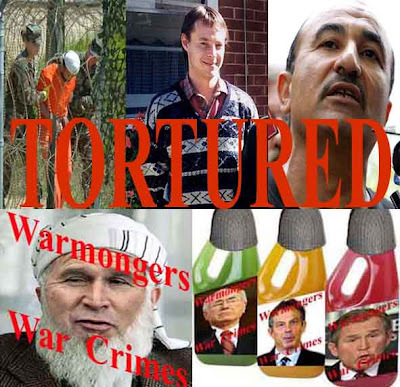 Australia's old foreign policy red paper says Australians have become targets because their own government is being run by war criminals that are complicit in state terror, torture, murder, occupation and genocide. UK Reid, Blair and the reichstag London threat! The nature of the [alleged] terrorist threat to London is on the scale of the [USA false flag] September 11 attacks in the United States, the chairman of Britain's governing Labour Party said. Bin Laden calls? CIA blind man's bluff! A [US propaganda, fear-mongering] taped message purportedly from Osama bin Laden has warned Arab nations against supporting a war against Iraq but has branded Saddam Hussein an infidel. "If there is a target person the police would have powers in relation to that type of person," Mr Costa said. Asked what he meant by "type of person", Mr Costa said: "The example that's been given is if there's a description of somebody, an identikit photograph released by Interpol or other agencies ... these powers may well be exercised on that type of person." New South Wales Premier Bob Carr has defended the Federal Government's decision to issue a warning to Australians about a possible terrorist attack in Australia. Posted on the Resistance web page Bronwyn Powell, an organiser of the youth-led mobilisation told Green Left weekly that "in the face of attacks on civil liberties, it is unfortunate that some union officials have felt they need to submit. It could set a negative precedent for upholding the hard-won right to demonstrate in the street." PIERS AKERMAN DT 28 Nov 02: JUSTICE John Dowd should be removed from the bench. His crime? Stupidity. In a breath-taking display of hand-wringing sanctimonious morality, Dowd has condemned the State and Federal Governments' anti-terrorism measures, claiming they erode rights and give encouragement to oppressive regimes. The NSW Government is to introduce increased police powers bill. Legislation giving New South Wales police special powers to deal with an emergency terrorist situation [emergency scapegoat situation] will be introduced into the New South Wales Parliament today.